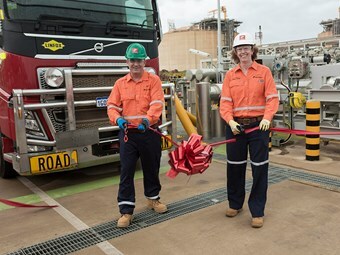 Woodside’s new liquefied natural gas (LNG) landside loading hub at Karratha is officially open and with it confirmation of its future transport fuel vision for Western Australian. WA premier Mark McGowan was on hand as the Pluto LNG Truck Loading Facility event. According to Woodside: "By making LNG available for remote power generation and as fuel for heavy transport used in mining operations, Woodside intends to create new markets." Longer term, it hopes to supply LNG to bulk ships visiting the region and, longer term, it is planning bunkering facilities to that end. Trucked LNG will also be used to supply coastal ships, including the LNG-powered Siem Thiima, which joined Woodside’s fleet in 2017. Woodside COO Meg O’Neill beileves the Pilbara is an ideal hub for an LNG fuels market, with established LNG processing facilities located near large-scale mining operations and port infrastructure. "The Pluto LNG Truck Loading Facility is a further demonstration of our commitment to supplying domestic gas, and highlights Woodside’s drive to find new markets for our cleaner LNG," O’Neill says. "Around three billion litres of diesel are imported into the Pilbara every year, mainly for the mining industry. In addition, the ships exporting iron ore to international markets from the Pilbara consume approximately five billion litres of heavy fuel oil annually. "Woodside believes that LNG produced here in Western Australia can replace those higher-emissions fuels, delivering environmental benefits while supporting the growth of local industries and creating new markets for locally produced LNG." The initial capacity of the facility is 100,000 tonnes a year, based on seven truck loadings per day during daylight hours. "It is great to be celebrating this event alongside the Murujuga Aboriginal Corporation, represented today by CEO Peter Jeffries," O’Neill says. "One of the great initiatives of this project is the cultural awareness training being provided by the Murujuga Rangers to the truck drivers that will use this facility, and we’re pleased that a couple of the Rangers could also be here today." Woodside has secured an agreement with Sheffield Resources to supply LNG to its Kimberley Thunderbird project. "We have formed a downstream joint venture with EDL Energy to develop integrated solutions and offer miners a suite of solutions which best meet their needs; including gas facility storage and vaporisation, gas-fired power generation and renewable generation," O’Neill says. "In addition, we are partnering with experienced transport company Linfox to ensure the LNG is delivered safely and on time to customers." "I congratulate Woodside on the opening of their new LNG truck loading facility and the new opportunities this creates in our state's north," McGowan says.